The sum of all the different dissolved organic molecules in domestic wastewater can be approximately characterized by the average molecular composition C18H19O9N (Popel 1997) with a mass of 393 g mol-1. For wastewater with 1 mol m-3 C18H19O9N (or 393 g m-3), 17.5-32 = 560 g m-3 O2 is needed and 18-12 = 216 g m-3 CO2-C is produced. S = 280 g m-3 BOD5 (biochemical oxygen demand over 5days without nitrification). • Only a part of the organics in the wastewater can be used by the bacteria as a carbon and energy source. • Some substances can only be partly used. Some products of metabolism are excreted. • Bacteria die and form lysis products, which can only be used in part by living bacteria. • After 5 days, some biodegradable substances are still left. Therefore, occasionally BOD10 or BOD20 are used. The COD and DOC of pure organic substances can be calculated in the same way as shown above, giving the theoretical COD S^,. Again, the measured values Sst and Srt are lower for the reasons mentioned above. Some data have been published for a number of chemicals often used in chemical industry (Busse 1975; Pöppinghaus et al. 1994). 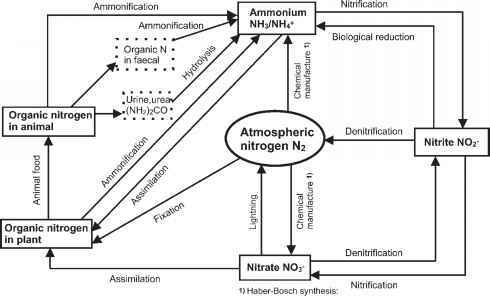 Of more practical importance are the dissolved organics from the processing water of specific products. Mostly, they consist of thousands of specific compounds, as discussed above for domestic wastewater. Table 2.2 presents data on the substrate concentration S measured as COD and BOD5 in processing water from the food industry. Usually the standard method is used to measure COD. Table 2.2 Some typical concentrations of wastewater from the food industry (Lehr- und Handbuch der Abwassertechnik 1985). Fig. 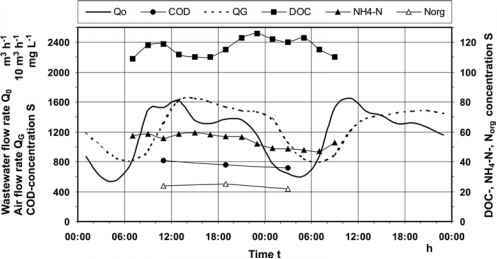 2.3 Daily change in flow rate and concentrations (• COD, ■ DOC, A NH4-N, A Norg) at the municipal WWTP Waßmannsdorf, near Berlin, BB 12 (basin 12), 14/15 November 2001, Q0 from on-line measurements, concentrations from 2 h mixed samples. industry (Lehr- und Handbuch der Abwassertechnik 1985). Wastewater with high loads of organics must be treated separately in other industries such as the chemical industry, oil refineries, paper and cellulose production and the pharmaceutical industry (Lehr- und Handbuch der Abwassertechnik 1985). In contrast to the flow rate, the concentrations of organics are nearly constant over a 24-h period (Fig. 2.3). Therefore, the changes in load at municipal treatment plants are defined approximately by their change in flow rate. In contrast, the change in the loads from industries can differ remarkably from the changes in flow rate.